Easily Check Your Diopter Numbers. In many respects this calculation is more accurate and relevant than computerized photoropter measurements at the optic shop, and even more detailed than looking at a Snellen chart. 2. Use the instructions to find where the text on the screen just barely starts to blur. 3. Measure the distance from your eyes to the screen at this “blur-distance”. 4. Enter your current diopters (optional). The calculator will now show you your correct diopters. –> Next: Go To The Calculator Here. *Best font size? 12 points. Or for a more detailed explanation, see here. It simply calculates diopters (diopter being nothing more than inverse meters). The variance is how you look at the ‘edge of blur’. Important to note here is that you want to be where things are still clear, but another half centimeter further away, you notice a loss of sharpness. This requires a little bit of experimenting. You can also look at your current diopter values, and the related centimeters – so now you can get that exact distance to the screen and see how sharp the image is (without wearing glasses). How much can you move backward from your centimeter equivalent of diopters? If you can move back and still see sharply, you’re over-“prescribed”. Click the link below to be taken to the centimeter calculator. Take a moment to read the instructions. It takes a small measure of patience to find your values the first time – quite worth it! 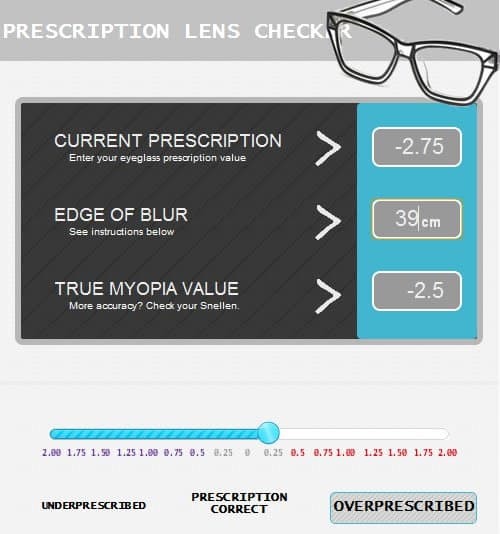 You can easily check your diopter value, and the degree of changes throughout the day. New Option: You can now skip the step of converting centimeters to diopters. Find my Myopia Ruler here. Also find the excellent astigmatism diopter measuring tool here.